The TTUH-CO series heater is mounted through a 27/16" dia. (6 cm) opening in bottom of vessel. 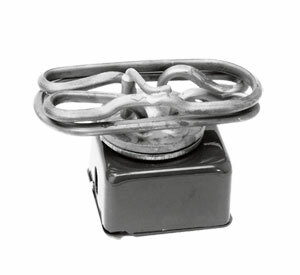 Heater is inserted with gasket through top of vessel or through hand hole. Mount combination terminal box and clamp over the element flange and use bolt to draw mounting clamp tightly to the tank. When mounting in a closed tank, a hand hole should be cut in the side of the tank only large enough to insert the heater and reach to the bottom of the tank to insert in the 27/16" dia. (6 cm) mounting hole. See To Order table for heater dimensions. The type TTUH heater is mounted through a 27/16 " dia. (6 cm) opening in bottom of vessel. Heater is inserted with gasket through top of vessel or through hand hole. Mount combination terminal box and clamp over the elements flange and use bolt to draw mounting clamp tightly to tank. When mounting in a closed tank, a hand hole should be cut in the side of the tank only large enough to insert the heater and reach to the bottom of the tank to insert in the 27/16 " dia. (6 cm) mounting hole. See To Order Table for heater dimensions. Model No. kW W/in2 Dimensions Inches (cm) Wt. *Designate voltage, i.e., 120 for 120 VAC, 208 for 208 VAC or 240 for 240 V, or 480 for 480 V.
Other kW rating and voltages are available. Contact OMEGALUX™. /* Designate voltage, i.e., insert 120 for 120V, 240 for 240 V or 480 V.